With one of the most recognizable quotes in history, “December 7, 1941 - a date which will live in infamy,” Franklin D. Roosevelt brought the nation together in a time of despair and tragedy. The Pearl Harbor Memorial, comprised of the WWII Valor in the Pacific Monument; which includes the USS Arizona, USS Utah, and the USS Oklahoma memorials Battleship Missouri Memorial; USS Bowfin Sumarine Museum and Park; and the Pacific Aviation Museum recently celebrated its 75th anniversary by commemorating the 2,403 lives lost. 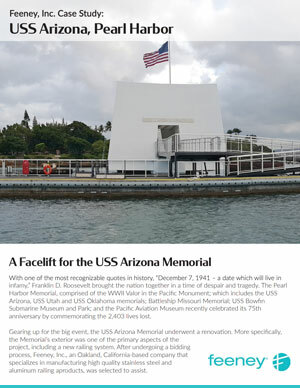 Gearing up for the big event, the USS Arizona Memorial underwent a renovation. More specifically, the Memorial’s exterior was one of the primary aspects of the project, including a new railing system. More information on products used: DesignRail®, CableRail Kits. 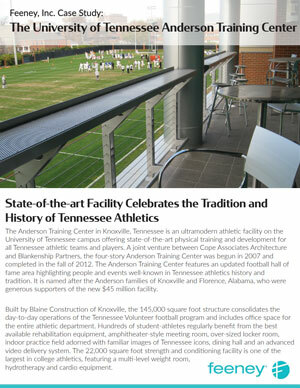 The Anderson Training Center in Knoxville, Tennessee is an ultramodern athletic facility on the University of Tennessee campus offering state-of-the-art physical training and development for all Tennessee athletic teams and players. A joint venture between Cope Associates Architecture and Blankenship Partners, the four-story Anderson Training Center was begun in 2007 and completed in the fall of 2012. The Anderson Training Center features an updated football hall of fame area highlighting people and events well-known in Tennessee athletics history and tradition. It is named after the Anderson families of Knoxville and Florence, Alabama, who were generous supporters of the new $45 million facility. More information on products used: CableRail Kits for Metal (3/16" cable). 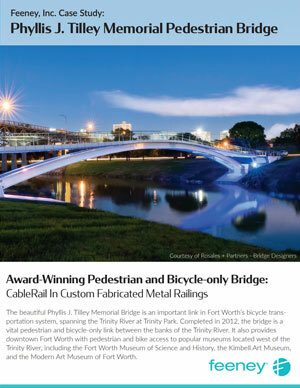 The beautiful Phyllis J. Tilley Memorial Bridge is an important link in Fort Worth’s bicycle transportation system, spanning the Trinity River at Trinity Park. Completed in 2012, the bridge is a vital pedestrian and bicycle-only link between the banks of the Trinity River. It also provides downtown Fort Worth with pedestrian and bike access to popular museums located west of the Trinity River, including the Fort Worth Museum of Science and History, the Kimbell Art Museum, and the Modern Art Museum of Fort Worth. More information on products used: CableRail Custom Solutions (3/16" cable). 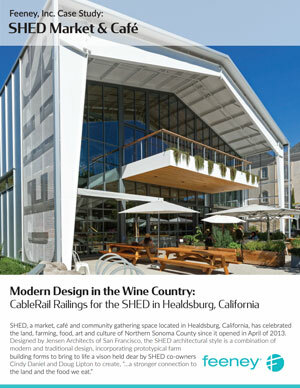 OAKLAND, Calif. (September, 2014) – SHED, a market, café and community gathering space located in Healdsburg, California, has celebrated the land, farming, food, art and culture of Northern Sonoma County since it opened in April of 2013. Designed by Jensen Architects of San Francisco, the SHED architectural style is a combination of modern and traditional design, incorporating prototypical farm building forms to bring to life a vison held dear by SHED co-owners Cindy Daniel and Doug Lipton to create, "...a stronger connection to the land and the food we eat." More information on products used: CableRail Kits, Fixed Lock Toggle and Threaded Terminal fittings, Micro Cross-Clamps. OAKLAND, Calif. (April, 2014) – Challenged by restrictions imposed by the local Victorian Historic District and a personal goal of building a sustainable home within a strict budget, sustainability expert Tommy Linstroth and his team achieved sustainability without sacrificing beauty. Linstroth Residence in Savannah Feeney, Inc. Case Study: Linstroth selected CableRail by Feeney railing infill for his new home located in the historic district of Savannah, Georgia; widely known as one of the most picturesque old-style residential districts in the southeast. More information on products used: CableRail Kits for Metal, CableRail Kits for Wood. OAKLAND, Calif. (April, 2014) – Located in one of the most exquisite oceanfront settings of any of the Feeney, Inc. commercial DesignRail® installations, the Whaler Condominium Project on Ka’anapali Beach, Maui, the Whaler Condominium Project on Ka’anapali Beach, Maui, Hawaii, presented a number of unique and complex staging, environmental and product design challenges. 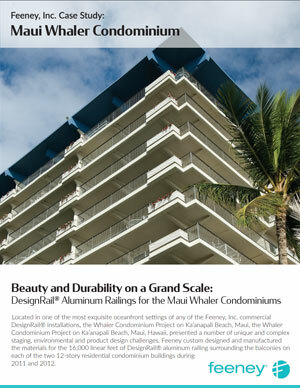 Feeney custom designed and manufactured the materials for the 16,000 linear feet of DesignRail® aluminum railing surrounding the balconies on each of the two 12-story residential condominium buildings during 2011 and 2012. 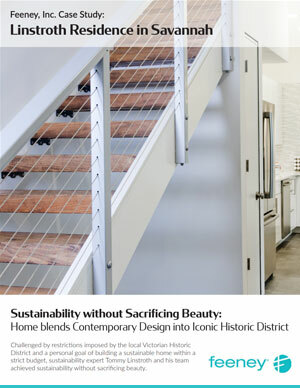 More information on products used: DesignRail® Create Your Own railing. OAKLAND, Calif. (June, 2014) – The Southern Living Idea House 2013 in Fontanel is part of Southern Living Magazine’s 24 year long tradition of building an annual Idea House in the South. 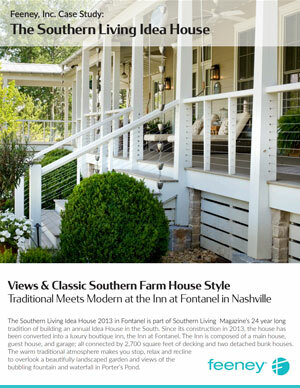 Since its construction in 2013, the house has been converted into a luxury boutique inn, the Inn at Fontanel. The Inn is composed of a main house, guest house, and garage; all connected by 2,700 square feet of decking and two detached bunk houses. The warm traditional atmosphere makes you stop, relax and recline to overlook a beautifully landscaped garden and views of the bubbling fountain and waterfall in Porter’s Pond. More information on products used: CableRail Kits.